Do you use your website to market your music? If not, you should be.A website is an incredible tool. It’s your space, and you can do whatever you want with it to promote your music. As powerful as social media and email marketing are, there’s nothing quite like leveraging your website to build awareness for your music. In this guest post, you will learn about how landing pages can help you get more streams or purchases for your album. Interested? Read on! And, if you think you have what it takes to contribute a guest post of your own, peruse our guidelines for more details. If you’re a musician putting music into the world, you’ll want as many people as possible to hear your work. 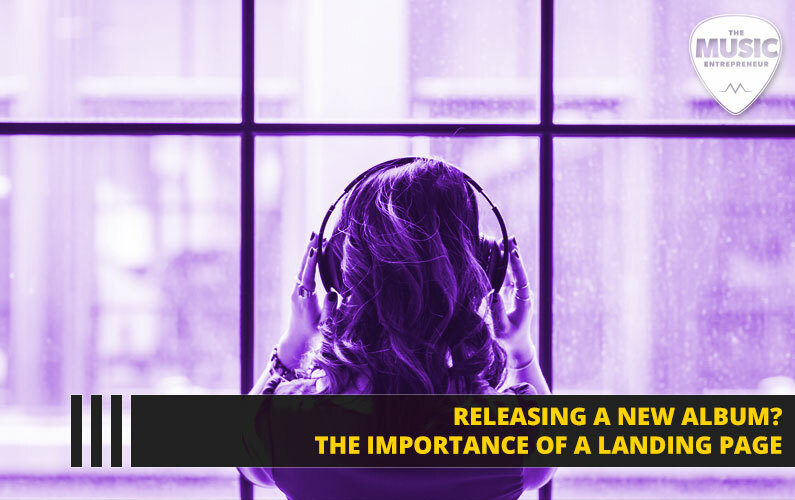 The hours spent perfecting your tunes have been long, and you need to showcase that final product with a killer landing page. The homepage of your website usually stays unchanging, but a landing page can be a specific page you direct people towards if you want them to check out your album. You can have many different landing pages for different audiences; it’s all about the user journey, and you can tailor it for each type of person who may find your music. If you’re promoting your album to your Twitter followers, they don’t need to see all the information about you on the homepage, they just want to see where they can download your music. Similarly, if you’re paying for sponsored posts on social media, your landing pages needs to have just enough information to introduce you to people viewing your page, without distracting visitors from buying and/or streaming your album. Make the landing page memorable, but don’t distract from the main aim. Little widgets and videos might be great on your homepage, but you should effort to keep things simple on your landing page – you don’t want any distractions! Be sure to use color and play around with font sizes. Think of some bold headlines, but try to keep the copy short, as your visitors won’t want to see a wall of text when they land on your page. They’re there to check out your music, so keep their attention! Think of the best way to summarize your music to people who perhaps haven’t listened to your music before. If you’re stuck for words, look at how some of your favorite artists summarize their music, and that should give you a starting point. Make it easy for everyone to find your music by including a large button where they can click through to stream or buy your music. Make it a striking color so they can’t miss it! Some people might find themselves on your landing page but might not be ready to download or stream your album right now. By including your social media links, visitors always have the option to follow you and check out your music later! Armed with a strong landing page, you’ll be in a much stronger position when it comes to marketing your music. You work hard on the production – don’t forget to put the time in when it comes to getting your music out there! itcher is a music recommendations app that finds titles you'll love. Discover your next favorite movie, TV show, book, album and game by checking out the web app now or downloading it on iOS or Android.